Rising sea levels have major implications for coastal gardens. 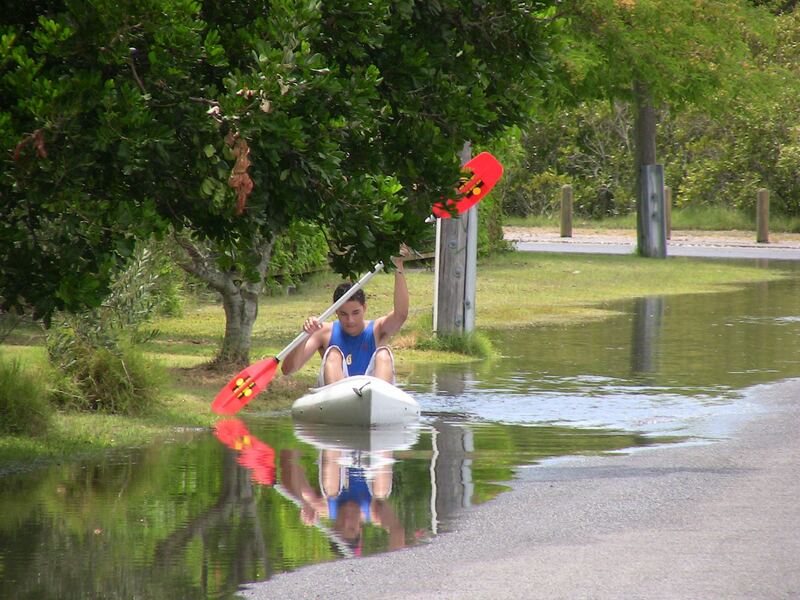 Yesterday’s king tide gave us the perfect opportunity to see what will be commonplace by 2050. One corner of the world that is experiencing greater than average sea level rises is north eastern Australia. Even if all greenhouse gas emissions ceased immediately, oceans respond very slowly. As water warms it expands, occupying more space, while melting ice caps and glaciers further add to ocean volumes. Sea level rises are not uniform, in part due to the unequal effect of tidal surges and also the unequal influence of our magnetosphere. Cairns, the Torres Strait and the Gold Coast are particularly vulnerable, but sea front gardens all around Australia face a simple choice: adapt or decline. Many people seem willing to wait until the next high tide enters their home to think about what happens next. So many things are already being affected. I’ve visited residents at Woodgate, QLD, about the beach erosion, affecting coastal property, and the saltwater which is infiltrating the freshwater aquifers farmers use to irrigate crops around the Bundaberg region. This warning comes from the CSIRO: “Sea level changes impact on coastal ecosystems, water resources, and human settlements and activities. Regions at most risk include heavily populated deltaic regions, small islands (especially coral atolls), and sandy coasts backed by major coastal developments”. Read the CSIRO’s research about oceans and coasts, sea level rise observations, projections and causes. A recent development is Queensland’s Inskip sinkhole. It’s funny that even in the face of an enormous body of evidence to the contrary, that the first thing people believe about an event like this is earthquake activity, not accumulating impacts of Global Warming. The area may be known for this kind of an event, just expect more ‘odd’ or ‘unusual’ events to occur – as with the weather – as our coastlines are relandscaped by sea level rise and extreme weather events due to Global Warming. Have a look at this ABC 7.30 Report (transcript and video) for insight into this issue, or read local coverage on yesterday’s king tide at the Courier Mail. While this information is useful, remember that all bets are off if the Greenland or Antarctic ice sheets melt. These will create a tipping point from which there’s no return. To secure the resale value of ‘Bellis‘, my home, I chose a place that is 1 km inland and about 9 metres above sea level. The loss of either of the two ice sheets will create a 7 metre sea level rise and all 154 million people in Bangladesh will become refugees along with people from most low lying coastal cities, around 40% of humanity. I never expected to live in a sea front property, but I won’t live long enough to bear witness. The most sobering point is that should we cease all Greenhouse Gas emissions today, there’s is already sufficient in our atmosphere to guarantee two hundred years worth of sea level rise. That’s a lot for our coastlines to absorb.